After India launched air strikes in Pakistani territory, tensions have escalated between the neighbours. Indian defence analyst Ajai Shukla explains the significance of the attack and what could happen next. The ball is in Pakistan's court after Indian Air Force (IAF) Mirage 2000 fighter aircraft crossed deep into Pakistan on Tuesday morning. India says that the air strikes targeted a militant camp near Balakot in the province of Khyber Pakhtunkhwa. However, Pakistan has disputed this claim, saying the strikes hit an empty area. 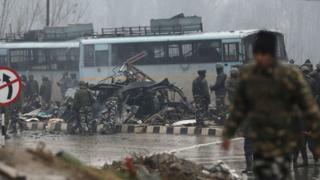 The air strikes were provoked by the killing of at least 40 paramilitaries in Indian-administered Kashmir on 14 February, in a suicide attack which has been claimed by Pakistan-based terrorist group Jaish-e-Mohammad. Indian leaders, including Prime Minister Narendra Modi, had vowed revenge. Tuesday's air strikes are the first launched across the LoC (line of control) - the de facto border that divides Kashmir - since a war between the two countries in 1971. Not even during the 1999 Kargil war did Indian aircraft cross the LoC. Both militaries have scrupulously observed a confidence-building measure that prohibits fixed-wing aircraft from flying within 10km (6.21 miles) of the LoC and helicopters from coming closer than 5km without informing the other side beforehand. For the first time, India has deliberately breached this contract. In the unwritten set of rules that govern action and reaction between the two militaries on the LoC, air strikes constitute a major escalation, which is significantly higher than punishing Pakistani posts by cross-border firing, or even sending ground troops across. These air strikes have gone several steps ahead of the "surgical strikes" of 2016, when India attacked militant camps across the LoC after Indian soldiers were killed in an attack by Pakistan-backed militants. The apparent ease with which Indian air force fighters flew 80km into Pakistan-administered territory, undetected by a military that should have been on high alert after open Indian threats of attack, again exposes the rudimentary capability of Pakistani air defences. This should reinforce the concern that arose in 2011, when American helicopters flew undetected into Pakistan, carrying naval commandos who killed Osama bin Laden in Abbottabad and flew out with his body. After India's air strikes, escalation is possible - but not certain. Pakistan has warned of retaliation and threatened to take the issue to the United Nations. But like after the "surgical strikes", Pakistan has again downplayed the attack. It first stated that this was a limited incursion by a few Indian air force fighters, which fled when the Pakistani air force scrambled its jets. The Pakistani army's public relations chief then switched tack and claimed that the bombs did no damage before adding that the place that was struck, Balakot, was just 5-6km across the LoC. This obfuscation is made possible by the fact that there are two towns by the name of Balakot - one just across the LoC from the Indian town of Poonch, and the other deep inside Pakistan in its Khyber Pakhtunkhwa. The BBC reports that the strikes were in the latter, where local villagers say they heard explosions. What is militant group Jaish-e-Mohammad? Pulwama attack: What are Modi's options? Having denied a deep incursion by the Indian air force, Pakistan has reduced its burden of retaliation. It remains to be seen whether more compelling evidence eventually embarrasses Pakistan's military into having to respond. For now, India has indicated that it has achieved its aims. Pakistan is unlikely to raise the ante beyond a point, given that escalating tension is a game with uncertain outcomes. Meanwhile, the Indian military has been placed on alert, with leave of personnel restricted. The air force is patrolling airspace, while the Indian Navy, which had been involved in a major exercise, has shifted to combat mode. Additionally, security forces in Kashmir have been boosted significantly, with the Indian government readying for the possibility of increased militant activity backed by Pakistan. Pulwama attack: What is militant group Jaish-e-Mohammad? Viewpoint: How far might India go to 'punish' Pakistan?